GRYB , J. David Barnhart, JDB Games, 2000. Game review by Dan Becker, 2001/03/18. For those who like abstract, family strategy games, GRYB is a tough, brain-burner of a game. Actually, it's more than just a game. It's an entire family of games depending on which rules you choose to use. Avoiding the use of the die, it can be nearly as thoughtful and penetrating as Go . If you are not so inclined, the die can be introduced making it simpler and more fun than Nine Men Morris . Regardless of which rules you use, its easy-to-learn rules and compact form make it a whole bag of fun for two players. For the $14.95 list price, you get a cloth board, a plastic four-sided, four-color die, a cloth bag, and a GRYB Game Manual . To play, you will need two sets of coins, but Go stones, as shown in the photos, glass beads, coins, or black and white checkers also make handy game pieces. 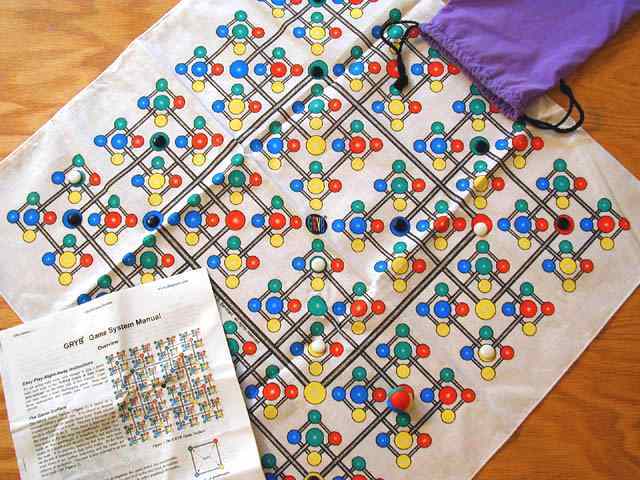 The most innovative part of the game is the cotton fabric game board. 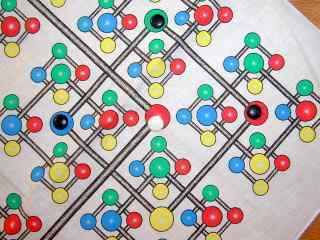 Although it is tough to see at first, the board is a flattened three dimensional tree of GRYBs - shorthand for Green, Red, Yellow, Blue. One of each color is on the corner of a GRYB square. The top level GRYB is shown in the photo midway between the outer edge and the center of the board. From this top level GRYB, each corner leads to a smaller GRYB, one level down. The GRYBs form a tree 4 levels deep. Obviously the inventor has mathematical bent to have dreamed up this crazy board. In the basic game, there are three legal moves which are determined by a roll of the four-sided, four-color die, which we call the GRYB ball. Introduce a new piece to the corresponding color of the top-level. Move an existing piece to the corresponding color of the next deeper level. Capture an opponent's piece on the corresponding color of the same level. The basic game ends when one opponent has covered all four colors of a GRYB square. Points are awarded in a geometric progression, one point for the top level GRYB, two points for a second level GRYB, four points for a third level GRYB, and so on. After 3 games, the person with the most points wins. Although the basic game is enjoyable and fun for most ages, it is in the advanced rules that the game shines as an abstract strategy game, somewhat similar to Nine Men Morris or multi dimensional Tic, Tac, Toe . My first hint is to get rid of the die. As described in the game manual, there are many more rules parameters that may be changed: whether pieces enter from the top of bottom of the tree, direction of movement, capture capability, number of moves per turn, etc..
My favorite game is based on the 'Drangles rules in the game manual. However, rather than ending and scoring at the first GRYB, the game is played until the board is filled or one person has completely outscored the other. I disallow the normal replacement capture rules and allow a capture when one opponent completes a GRYB. I am still experimenting with limiting this capture to the same level. It makes the first level GRYB worthless for captures, but makes the battles more focused. This is a longer game, but very strategic. You might not like this game if you do not like Go , Morris , or multi-dimensional Tic Tac Toe . If abstract strategy is not your bag, I suggest you look else where. My only complaint about the game production is with the game manual - at times a bit dense and tough to read. Perhaps a reformatting or not so many examples per figure. The basic rules show all 3 legal moves in one figure. Another figure (figure 5) has no less than 12 examples! However, it is interspersed with humor and fun ideas making it worthwhile to read. One suggestion is to have the loser wear the game board as a bandana in public - "Ronald McBiker." Finally, if you grow to like this game, you most assuredly will have to dedicate some tokens or beads to the game. If you want a nice compact strategy game, GRYB is for you. Last modified: Thursday, 09-Jun-2011 12:36:47 MST.